When I make salads, I tend to stay away from macaroni salad, cole slaw and potato salad. Maybe, that is because, they are the only salads, other than tossed salads, I had - growing up. I can't say that I don't like them. I usually do. With all the new style salads with fruits and vegetables that were not popular when I was a child, I am inspired to be more creative. I do like cabbage so cole slaw does show its head at times but rarely potato salad and almost never, macaroni salad. This is a hearty salad and despite my hesitation, it is really good. Place in a large pot filled with boiling water. Cook for about 18 minutes. They should be cooked through but not soft. Use bench scraper or sharp knife to fine dice eggs. Cut pickles into small pieces. Cut potatoes into small pieces (1/4 of an inch) and place in large bowl. 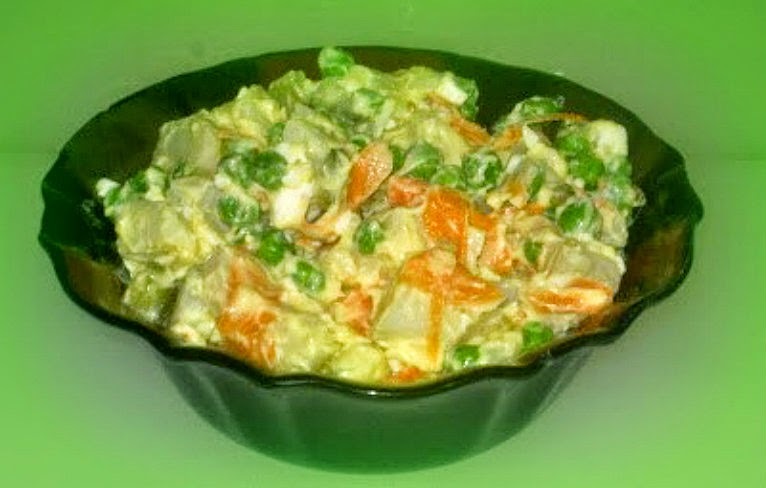 Stir in the eggs, pickles, mayonnaise, mustard, and the peas and shredded carrot.